Get ready to play. 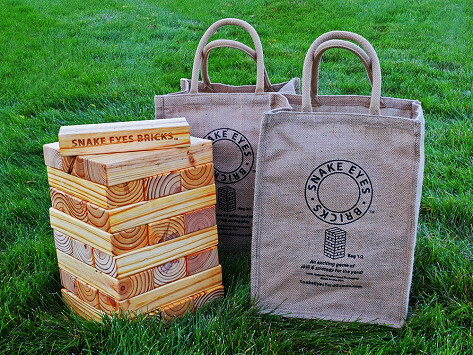 A gaming classic has made its way outdoors, thanks to Jeremy Exley, creator of Snake Eyes Yard Dice. An inventor and avid dice player, Jeremy wanted to play his favorite games away from the tabletop, so he created palm-sized dice (3.5 cubic inches) for tossing and throwing outdoors. 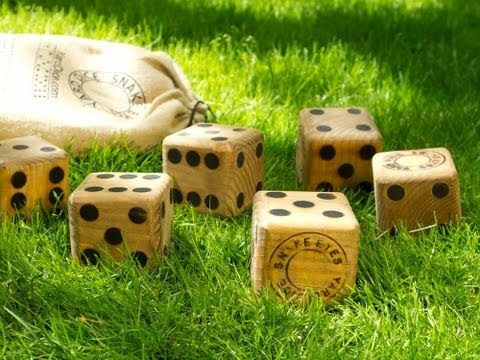 Yard Dice and Dominoes are fun, portable, and perfect for picnics, barbecues, outdoor concerts, beach outings and more. The whole family can enjoy classic dominoes and dice games like Greedy, Whamee, Balut, Pig, and Bunco. These games are handmade in Minnesota from solid wood with branded pips (the dots on the face of each die) and a rich finish. The Yard Dice set includes 6 dice and directions for 10 different dice games. The Yard Dominoes set includes 28 dominoes, from double blanks to double sixes. Both come in a rustic drawstring bag for easy portability.